Soon after I played last week’s “mystery record” several sharp-eared listeners wrote in to let me know the name of the tune that started off last week’s show. Unfortunately, we still don’t know the identity of the band, but research continues. The “mystery record” was an instrumental version, but we start off this week’s show with a vocal version of the song. Tune in to find out what the song is and all about the history of the song, and the life of the composer and lyricist. We’re also going to hit the trail, celebrate the birthdays of Al Stillman and Gone With The Wind, and get ready for the upcoming holiday. 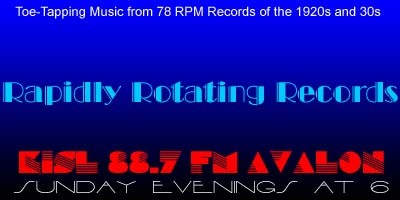 If you enjoy the show, please let us know by leaving a comment on the website or the Facebook page or sending an email to Glenn@RapidlyRotatingRecords.com. And remember, your requests and topic segments are always welcome. As always, just click on the link below to instantly listen streaming online and/or download the show. Blazin’ The Trail (To My Home) – Ray Noble AHO / Al Bowlly, v.
At The End Of The Lonesome Trail – Arcadians Dance Orchestra / Maurice Elwin, v.
I’ll Still Be Loving You – Richard Himber and His Essex House Orchestra / Stuart Allen, v.
In The Middle Of A Dream – Jimmy DOrsey AHO / Helen O’Connell, v.
You And I Know – Ozzie Nelson AHO / Ozzie Nelson, v.
Gone With The Wind – Carl Ravell AHO / Carl Ravell, v.
Gone – Abe Lyman and His Californians / Sonny Schuyler, v.
Hello Miss Liberty – Six Black Diamonds (Billy James Dance Orchestra / Jerry Macy & John Ryan, v.
Yankee Doodle Boy / Mary’s A Grand Old Name – Carroll Gibbons and the Savoy Hotel Orpheans / Edna Kaye, v.